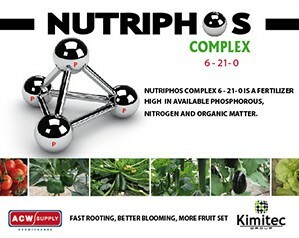 Kimitec Nutriphos Complex is a fertilizer that is high in phosphorous and a bit of nitrogen. Kimitec Nutriphos Complex is a fertilizer that is high in phosphorous and a bit of nitrogen. Make sure to not mix this product with sulphates, oils, alkaline products, boron or calcium as it can precipitate.